Congratulations Mr Huebner on your Horizon Award!! Congratulations to Mr. Joe Hubener, Social Studies teacher at Clearwater High School, who was notified today that he has been selected for the prestigious Horizon Award. The Horizon Award recognizes outstanding Kansas teachers in their second year of the teaching profession. Mr. Hubener is one of only sixteen (16) secondary education teachers statewide that were selected and he will be recognized by the Kansas State Department of Education in Topeka on February 15th. 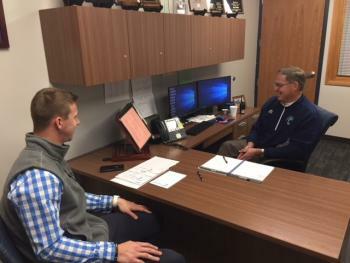 Shown below is Mr. Hubener receiving the conference phone call from Dr. Randy Watson, Commissioner of Education for Kansas congratulating him on his selection. We congratulate Mr. Joe Hubener for this very deserving recognition and we sincerely appreciate all of his work for our Clearwater High School students. Job Well Done Joe!! We are proud of you!